We love graphs, can you tell? Now your Total Principal, Cash Balance and Expected Return show you the fluctuation of your account from the start of your LendingRobot account. Your Accounts are now cleanly represented by your Account Value and Expected Return. You have a drop down for each account for more information: Managed Principal, Non-Managed Principal, Cash Balance, their Values and the Expected Return for each. 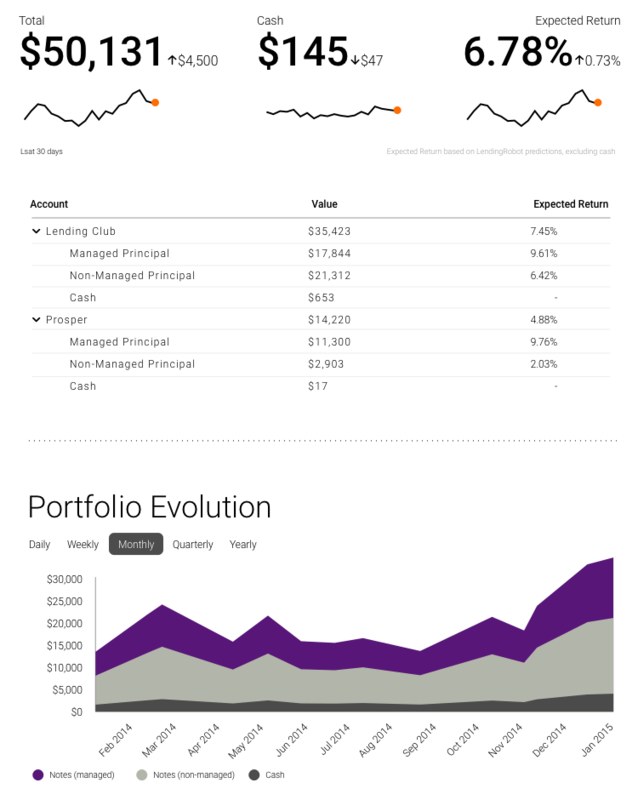 Your Assets Under Management chart is now your Portfolio Evolution chart because it’s not just assets under management by LendingRobot, it’s your entire investment portfolio. You have the option to see your Daily, Weekly, or Monthly investment portfolio progress with this chart. The only thing that hasn’t changed is your Cash-Flow Forecast… yet. Let us know what you think in the comments below, we’re always open to suggestions and we love your feedback! Looks great. Nice improvement aesthetically and analytically. Looking forward to seeing what you all have next in store for us. Thanks for your efforts. It is appreciated. Love the teaser at the end! Anticipating the “new” Cash-Flow Forecast! Indeed. Still waiting for the “new” Cash-Flow Forecast. ETA? We initially planned to have it released soon after this post. Although, after many feature requests from investors, like yourself, it’s still in progress. We are perfectionists when it comes to displaying and reporting data, thank you for your patience.